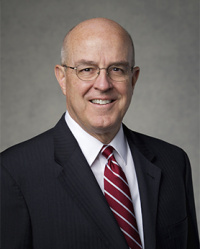 L. Whitney Clayton is a member of the Presidency of the Seventy of The Church of Jesus Christ of Latter-day Saints. L. Whitney Clayton was born on February 24, 1950, to L. Whitney Clayton Jr. and his wife Elizabeth. He grew up a member of the Church in Whittier, California. Elder Clayton began his education at the University of Utah, but interrupted his education to serve a mission for the Church in the Peru Andes Mission. He then returned to the University of Utah, taking a Bachelor's Degree in finance, then went to the University of the Pacific in California, where he earned a law degree. He married Kathy Ann Kipp on August 3, 1973, in the Salt Lake Temple. They have raised seven children. Elder Clayton worked for law offices until he founded his own law firm. In the Church, Brother Clayton served as Stake Mission President, High Priests Group Leader, Bishop, Stake High Councilor, and Counselor to a Mission President before being ordained a Seventy and called as an Area Authority Seventy in the Fifth Quorum of the Seventy. It was while serving in the Fifth Quorum that Elder Clayton received the call to the First Quorum and the ranks of the General Authorities. On April 5, 2008, Elder Clayton was called to the Presidency of the Seventy, replacing D. Todd Christofferson, who had been called to the Quorum of the Twelve Apostles. This page was last edited on 3 April 2018, at 21:55.